In San Diego, CA, where the weather is mild enough, homeless find any place they can. It is sad. 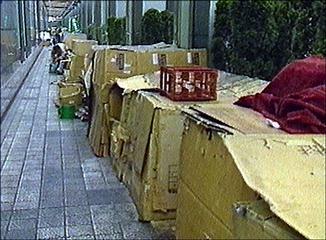 The only time I saw people living in cardboard boxs was 20 years ago in San Francisco. It was beyond sad as many of them were Vets and probably suffering from PTSD. We visited Chicago one summer and saw whole towns under bridge overpasses. Tent, cardboard--everything. I asked my son about winter. "Where ever they can." We have a place here, under the bridge. They use cardboard, old mattresses, whatever they have. Life is so hard when you hit bottom and cannot get back up. Vets and mental patients are among the highest #s.
Sad indeed. Any one of us could end up like that if the right dominoes fall. It doesn't take much at all, if income was lost, jobs were gone, homes were taken by banks, and other disasters. It is scary. Quite a moving post. It's horrific that people still have to live in cardboard towns. How do they manage in the snowy freeze of winter months? How do they manage at all? Very good question. Some homeless will seek room at homeless, others have mental issues and do not want to be clustered with others. How do they manage? No answer there. It just breaks my heart. In Florida we had quite a few due to the weather, here I haven't seen the first one. I once read that a lot of people are just 3 paychecks away from being homeless. As a society, we can do better. Oh dear Susan this is so touching and frightening! Here we see gipsy people choose to live in tents instead of permanent residence but never got chance to see homeless people living in such odd conditions. People's eyes get used to seeing homeless and move on. We contribute to them and have even bought a meal for one. Yes, the wealthy have more income and could help the homeless more than we of average income. Is there a true way to rescue these precious souls? To convince them to accept any help given?